If you can’t beat them, let them join you. 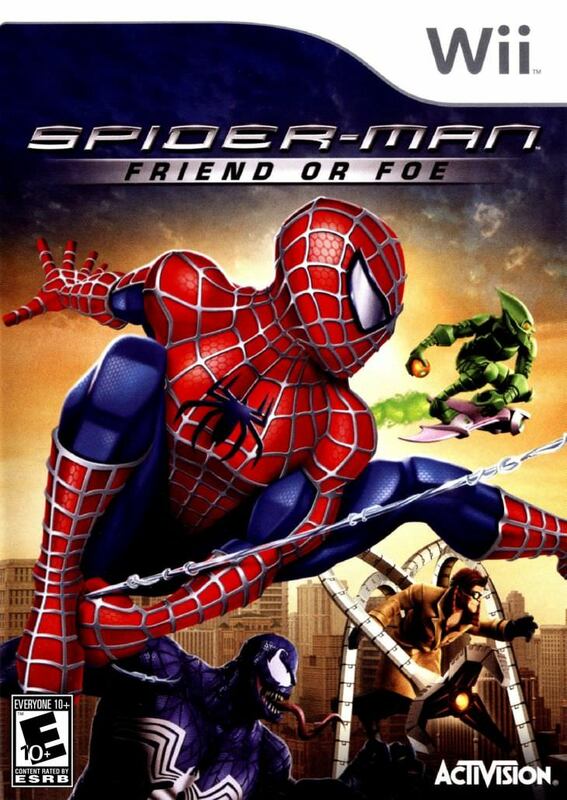 Spidey defeats classic villains then works with them to defeat a resourceful antagonist in the Wii version of the game Spider-Man Friend or Foe. Black Cat, Doc Ock, Green Goblin, Lizard, Rhino, Sandman, Scorpion and Venom are just some of the baddies who help the agile web slinger defeat a worldwide threat. Gamemakers center the action story on a military type group called S.H.I.E.L.D. who recruits Spidey to rid the world of new baddies originating for intergalactic material. Soon Spidey globetrots to locations including Cairo, Tokyo, Transylvania, Nepal and Indonesia. Players get an auto save option and three save slots to keep their progress intact. You’ll earn additional web talents over time, including the ability to shoot projectiles and wrap enemies up. The game keeps a good balance of open ended options and easy navigation. You can’t carry items into some areas but there’s occasionally more than one way to navigate through environments. Players also can’t get knocked off or run off ledges, which keep the action high and frustration low. Valuable inventory items come to you after breaking objects and defeating enemies so you can keep moving through the mildly challenging levels quickly if you like. Once players return to S.H.I.E.L.D. HQ, they can disseminate upgrade funds in several different ways. Predictably, defeating the bosses is a high challenge level requiring players to try different techniques that usually involve avoiding rapid fire weapons/enemies. Spidey encounters plenty of action and options in this multi-console game release. The two player format lets friends join the game as a sidekick at any time. Gamemakers design required combination moves (e.g. opening portals) to promote more co-operation between players. Players just flip the nunchuk to switch between characters. The versus mode has more limitations than the story mode, plus body throws sans barriers create some easy wins. This game could’ve used a question mark at the end, leaving a wide open field of battle where you weren’t sure if friends were your foes and vice versa. This element would’ve added some surprise and intrigue to the enjoyable proceedings, plus a constant sense of mild tension. A “spidey sense” slow motion element also would’ve showcased the fighting more as players could stop and enjoy Spidey’s multi-tasking mayhem. Using the film trilogy and numerous comic books as source material, Spider-Man: Friend or Foe assembles some classic confrontations as well as “dream” match-ups for players of all ages. A great casual game you can pick up and go. The button mashing combat should fit the standards for most. Many players will also enjoy the foot loose and fancy free antics of your friendly neighborhood Spider-Man. No angst ridden themes of responsibility and guilt here. Great voice work and minimal consequences (e.g. when you die you just lose a few tech tokens). Recommended (*** out of four stars) and rated E10+ for cartoon violence. Also available on Nintendo DS, PC, PS2, PSP, and XBox 360. Games published by Activision that used the Marvel licence were de-listed and removed from all digital storefronts on January 1, 2014 so look for physical copies of this fun, rare gem (e.g. a new Xbox 360 physical copy of this game is now priced close to $80). This entry was posted in Video Game Reviews and tagged Michael Siebenaler, Mike Siebenaler, Spider-Man, Spider-Man Friend or Foe, Tall Writer, video games, Wii. Bookmark the permalink.